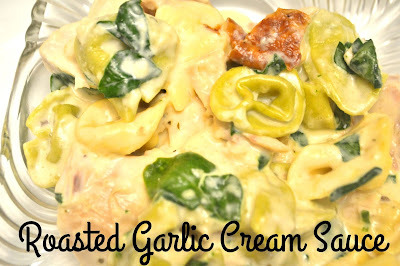 This Rich and Creamy Sauce is Big on flavor, but short on it's list of ingredients. It is easy to make, and simply luscious with any pasta or chicken dish you wish to serve it with. 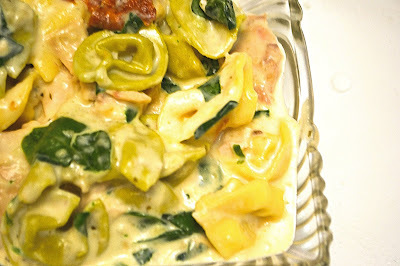 I love making my own garlic cream sauce that is versatile and you can use it to make all sorts of dishes, from a simple mix it into spaghetti noodles, to serving over baked or grilled chicken, or like today's dish, served over tortellini, with rotisseri chicken, and chopped spinach. It 's simpy so rich, so creamy, so flavorful, that you'll find yourself using this recipe as your go to again and again. I prefer this to a traditional alfredo sauce even, so this sauce replaces that for me. It onlyk has a few ingredients, but they are rich, simple uncomplicated ones, that just make this perfect in my book. Today I had one of those days at work, where I needed to figure out what to make for dinner, based on what I had on hand at home. I was having a bit of a stomach ulcer issue, so knowing that, it ruled out a tomato based sauce. I knew I had on hand a rotisserie chicken, some fresh spinach, and some cheese tortellini. I realized my Garlic Parmesan Cream Sauce would be perfect and I could whip up some thing yummy with all those ingredients, in no time at all. It's easily made into a skillet meal served with a seasoned cooked chicken breasts, or served with angel hair pasta as a side dish next to grilled chicken or a pork roast. the possiblitiies are endless. Remove cloves of garlic from head of garlc and mash with a fork. In a medium saucepan over medium-low heat, melt the butter, and add in the garlic. Pour in the cream and heat to simmering. Add flour and cream mixture and whisk till smooth. Continue stirring til sauce is thickened,for a 1-2 minutes. Fold in any pasta or ingredients you wish to serve it with, it is ready to serve.